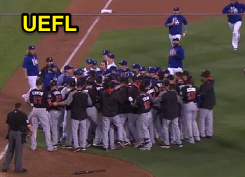 HP Umpire Carlos Torres ejected Dodgers pitcher Ross Stripling (Throwing At Marlins batter Giancarlo Stanton) and Marlins Manager Don Mattingly & Dodgers Bench Coach Bob Geren (Fighting) in the top of the 9th inning of the Marlins-Dodgers game. With none out and none on, Stanton took a first-pitch fastball from Stripling for a called first ball. Replays indicate the pitch was located significantly inside, thrown behind Stanton, and waist high, resulting in a bench-clearing incident, the call was irrecusable; there were two prior HBP (one for each team); warnings had not been issued. At the time of the ejections, the Dodgers were leading, 7-0. The Dodgers ultimately won the contest, 7-2. This is Carlos Torres (37)'s first, second, third ejection of the 2017 MLB regular season. Carlos Torres now has 7 points in the UEFL Standings (1 Previous + 3*[2 MLB + 0 QOCU] = 7). Crew Chief Dana DeMuth now has 4 points in Crew Division (1 Previous + 3 Irrecusable Call = 4). This is the 38th, 39th, 40th ejection report of 2017. This is the 15th player ejection of 2017. Prior to ejection, Stripling's line was 0.2 IP, 0 ER. This is the 21st Manager ejection of 2017. This is LA-NL's 2nd/3rd ejection of 2017, 1st in the NL West (LAD 3; COL, SD 1; ARI, SF 0). This is Miami's 5th ejection of 2017, 1st in the NL East (MIA 5; NYM, PHI, WAS 1; ATL 0). This is Ross Stripling's first career MLB ejection. This is Don Mattingly's 4th ejection of 2017, 1st since May 9 (Andy Fletcher; QOC = N [Balls/Strikes]). This is Bob Geren's first ejection since May 27, 2011 (Angel Campos; QOC = N [Balls/Strikes]). This is Carlos Torres' 1st ejection since September 10, 2016 (Hernan Perez; QOC = N [Balls/Strikes]). Wrap: Miami Marlins vs. Los Angeles Dodgers, 5/19/17 | Video via "Read More"